Let me clarify that~It used to be all about the Susans! Not so very long ago this garden was almost all about the Susans. Rudbeckia fulgida didn't mind the shallow soil that was crowded by limestone bedrock and spread by seed and rhizome everywhere. What was not to love about them. They were a beautiful mass of golden color from mid summer to fall; they never crowded out the day lilies that lived here first; and, they made me smile when ever I stepped into the garden or pulled into the drive. I loved the genus Rudbeckia so much that I invited all the species plants (and a few cultivars) that were endemic to Middle Tennessee to join R fulgida. The first to join the party was R laciniata...a tall droopy beauty with fabulous presence. Rudbeckia subtomentosa 'Henry Eilers' was next. R hirta 'Cherry Brandy' have stayed the course. Rudbeckia triloba is fast becoming a favorite. The flowers are smaller, but, the plant is a many branched beauty that's over four foot tall and still growing! Another choice small flowered rudbeckia that I chanced upon a few years ago (blooming earlier than usual) is R fulgida var fulgida. This is a keeper plant and I highly recommend it to any of you folks not so crazy about Susan yellow! You're laughing and wondering what ever do I see that makes this plant different from Miss Goldie! Trust me, she is stellar, with shiny, deep green foliage and smaller, refined blooms. Much finer than Rudbeckia 'Goldsturm'. She's a petite flower on a tall stem. This rudbeckia, like all the others, provides seeds in the winter for birds and nectar for butterflies from late summer through frost. and the exotic Lantanas that bloom their best when the heat is really turned on. The Susans are clearly Clay and Limestone's summer sizzling beauties and if you've heard me say this once, you've probably heard me say it a dozen times: I cannot imagine gardening without them. But, now, you'll hear me say, I cannot imagine gardening without the Susans and all their friends! Inspired by the words of Elizabeth Lawrence, “We can have flowers nearly every month of the year,” Carol of May Dreams Gardens started Garden Bloggers Bloom Day. It's celebrated on the 15th of every month, when garden bloggers from all over the world share their garden blooms. So head over to Carol's to take the Mr Linky magic carpet ride to more gardens than you can imagine visiting in one day! This is my August 2012 contribution. I hope you enjoy the Susans and friends. Your garden looks beautiful, Gail! I love those Rudies, tall ones, short ones, fat ones, skinny ones, all beloved by the pollinators, too. R. triloba is my fave here, so far, too. It's those smaller flowers and multiple branches. So sweet. Clay and Limestone makes me happy! What a gathering of Susans. They make quite the fashion show. Happy GBBD. Wow - several here for my list, especially that R. triloba, that is truly gorgeous. I also have a weak spot for Susans: two I've grown which are really worth chasing down if you can are delicate and elegant Rudbeckia fulgida var deamii and probably my favourite, the stately R. nitida 'Herbstsonne' - nearly 2m tall with drooping petals and gorgeous green cones. And R. hirta 'Cherokee Sunset' - annual here in the UK - filled my borders for weeks with shades of bronze, red, orange, yellow and copper last summer. Fabulous. Gail, I remember the first time I saw all your Susans here--it inspired me to plant some in my own garden, and I've loved them ever since. Such a cheery plant, weathering this drought without a word of complaint. You have so many varieties--and I'm so impressed you remember which is which! 'Cherry Brandy' and 'Prairie Sun' are two of my newer favorites. I didn't know they are called "the Susans", now i know. I have one courtesy of one blogger friend from the US, but it is not performing as beautifully as in its homeland. It tried its best to be acclimatized in our hot tropics, but not as prolific though. This rainy days they are succumbing to too much stress, and maybe they will be gone next dry season. I love actually your photos more than your flowers. I say that as a compliment, i hope you don't mind. Love all the Susans, miss having them in my garden. Had 'Cherry Brandy' but didn't really come back this year. Will fill out the hilly garden once the rocks are in place with a lot of Susans and her friends. I had so many in VA -- almost overrun with Susans in one garden. Wish I could say the same here. I recently took out two trees from a sunny area, and now I have to fill the space up with drifts of full-sun, drought-tolerant flowers. I'm planning to use lots of Susans and coneflowers there! This was a great little cavalcade of different types and their friends. Your gardens look absolutely gorgeous, Gail. I love coming here. You are such a good photographer. Looking good. You take such lovely shots of the flowers....and my favorites are the ones with the bees:) Beautiful garden. I really think Henry E. and Cherry B. need to find a place in my garden. Happy GBBD! Can I recommend Ratibida pinnata? It's my fav of the Susans. Rudbeckia lanciniata is similar, only with a green cone. I guess I should take a look at R. fulgida var fulgida as Ratibida is too big for my garden. Ah yes, of course! Thanks for the reminder - maybe I got a little too carried away with the Susan's and their friends this year...Happy bloom day. The Susans have friends! And they certainly compliment each other. They sure seem to be thriving in my garden this year--maybe because the drought killed off all the bugs. Your color (and foliage, and structure) combinations are wonderful, Gail! Note to self -- need to get more Susan's for my garden. Your garden looks like it is surviving this drought nicely, with your help. Thanks for joining in for bloom day. Nothing like pink to make yellows really "pop" in the garden. Things are looking good considering your dry conditions. When I lived on the coast with my meager pots I used to dream of Susans....and now I have a garden, and Susans. Granted they are volunteers, but still, hopefully many more to come. Your garden is stunning, the photography breathtaking. The Susans and their friends ALL make me smile! I must look for that Rudbeckia lanciniata here and maybe Henry Eilers, too. Gail you have identified about every Susan I have...I love them too and wish the mix of other blooms were flowering but they need more water...but the susans have stayed the course and they are giving me much joy. It was helpful to see so many Rudbeckias together. I wonder how many are native to my colder climate? I'm jealous ;) Something literally mowed down my Prairie Sun that I planted last year, all the way down to stubble. It's inside the deer fence, so I'm not sure who is responsible. I'd like to try again, but first I have to find out whodunit! In the meantime I'll have to live vicariously through yours! I had Henry E last year, I loved it. I lost it. Like an idiot I went to pinch of a bloom and pulled the plant out of the ground. I found out in the third year how aggressive goldstrum is, but I too have to have it. Lovely Susans and friends! I like the 'Henry Eilers' and the triloba very much. The triloba must be what is blooming in all the backwoods now and it looks so happy. This year my Susans did not do well:( But maybe next year! Great selection of flowers.Very pretty ! 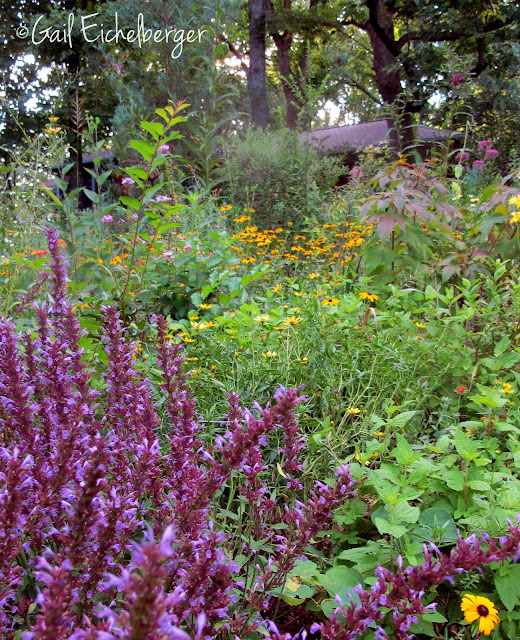 As I was looking at your photos, I thought to myself, "That garden is a riot of color!" I love it! I grow some of those. I'm not sure if I have any rudbeckia laciniata. I don't think I do. I sure like it! It reminds me of gray headed coneflower. Gail, ME TOO! I love this time of year when it is time to welcome the Susans into the garden. I only have Goldstrum, but what a show giver. It has been divided so many times, I think it has prodigy over the entire county. 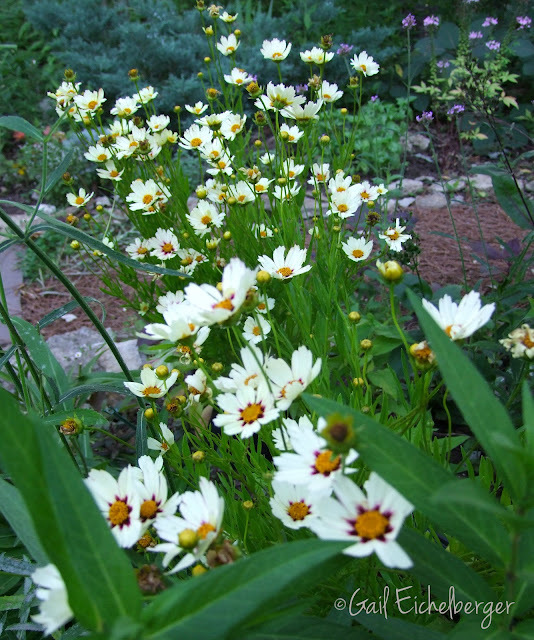 I love the variety that you have and will think about adding a few newcomers to my garden. Grateful for the choices you have offered. Lovely post...I love all those Rudbeckia...but especially adore the Vernonia. Mine just started blooming in the last few days...I always forget just how intense that color is!